It's sad that the Fantastic Four have slipped so far in Marvel's list of cool characters that their anniversary issue ends up being part of the tail end of a crossover that really harmed the overall makeup of the team and the personality of at least two of the characters. While JMS does an amazing job looking at the way the FF individually approach the superhero civil war, and Dwayne Mcduffie tries his best to explain what's clearly an editorial direction (Reed and Sue can't be apart for the 45th anniversary), the fact remains that Marvel really just doesn't do right here by the World's Greatest Superhero Team. While Tom Defalco, for all people say about his writing, gave the FF a grand adventure for their 30th anniversary, we get a retrospective from other characters while the FF themselves try to decide if there's going to be an FF at all. By the end, the FF is off in two different directions, leaving Paul Pope to capture the magic of the old Stan and Jack years in a great set piece with Johnny and Peter while Lee himself parodies Marvel's commercial ambitions while battling the Mole Man. This is not to say McDuffie does a bad job--in fact, he writes the Johnny-Ben dynamic about as well as anyone. I just feel like he got stuck with character-whiplash given where JMS ends his run. The Sue we see in the Civil War tie-ins just doesn't seem to mesh with, "let's go work on our marriage together." Having said that, and having done this review a bit backwards because I think it's interesting that Marvel took this tack--I mean, 45's not really THAT important, why not just leave it alone if you have a big dangling plot point that doesn't mesh with a team in harmony?--let's get into the meat of the trade, namely the FF's role in the Civil War. I have to give JMS a lot of credit here--he doesn't just re-hash what's going on in the main book. We see the war as it effects Ben, Sue, and Reed--Johnny kinda gets short shrift and just reacts his way to the anti-registration side. Some scenes mirror those in the crossover, but we get a different spin on them. The first major fight comes from Ben's neutral position, as all sides try to recruit him into battle and he watches civilians gets hurt. Worse, they're on Yancy Street, where Ben has a very personal stake. Every time I see comics like this--where the stories make sense within a comic book universe and don't try to be overly realistic, I get nostaglic for the old days of superhero comics. (And go out and buy more Essentials and Showcase Presents.) I appreciate that a lot of writers are telling good stories with a more realistic tone, but I don't appreciate the fact that I have to get my dose of good old fashioned slugfests and heroes deserving of the title by reading "kids" comics or nostalgia pieces like the Paul Pope backup. Perhaps most interesting here is JMS's characterization of Reed as a man afraid to take a risk. He'd rather calculate probabilities that justify his desire to keep what he has rather than do the kinds of things that got him where he is in the first place. The Reed Richards who stole aircraft, refused to care about Latverian sovereignty if the need arose to take down Doom, told the government to shove off the last time they tried a registration act, went all the way to Heaven to get Ben back, and took on Namor to keep his wife is long gone. I don't agree with that move, but at least it makes Reed's puzzling stance in Civil War make a modicum of sense. In turn, Sue's desire to stay the adventurer and fight for what's right rather than what's safe is also a nice progression for her character. Having had so much happen to her in the name of being "safe"--let's face it, in the early comics and even into the 80s, she's often given a back seat in the battles--Sue no longer feels that safe works. And Reed's protections are notoriously bad. (Anyone remember when he forcibly removed Franklin's powers?) She's willing to do all it takes--and when you're married to a man who's not, there's going to be conflict. Unless, of course, Marvel decides they have to stay together for the movies. This is my only exposure to JMS and McDuffie writing the FF. I need to go back and read both their runs, as I think their takes on the characters, while different, will be interesting. 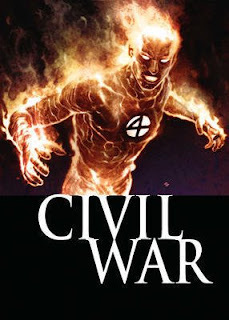 This trade is not mandatory reading for Civil War, but it's still very good. I mean, where else can you hear the Thing do his battle cry in French?